The Man Bird and I have been fortunate enough to dine at the Opulence restaurant located in the Cathedral Quarter (CQ) Hotel before, but have never actually stayed in one of the 38 rooms this boutique hotel has. By some stroke of exceptionally good fortune we were invited to stay for one night on a dinner, bed and breakfast basis and were very kindly accommodated in one of the King rooms. 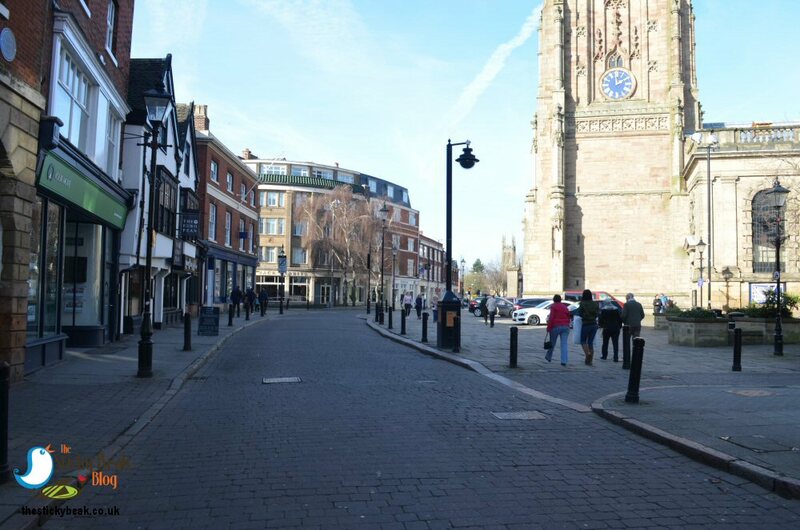 Other places to check out are the Quad, the Cathedral itself, and Derby Theatre. 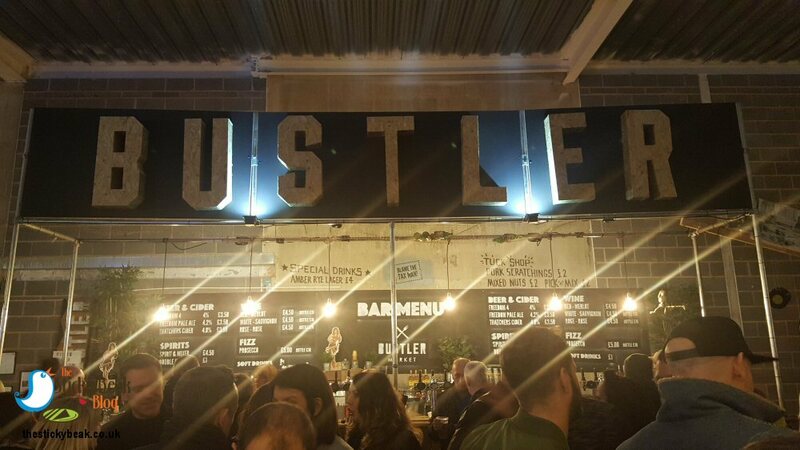 On the weekend we visited there was Bustler Street food market happening at its Riverlights location, the fair had been in town and was due to finish on Sunday 25th February, and the city was hosting a real ale and beer festival all weekend too. Having worked up an appetite, we decided to have lunch at Jack Rabbits and while away some time people watching. Before we knew it, it was past 3pm and we’d got massages booked in at 4pm at the CQ hotels Calla Beauty Rooms. 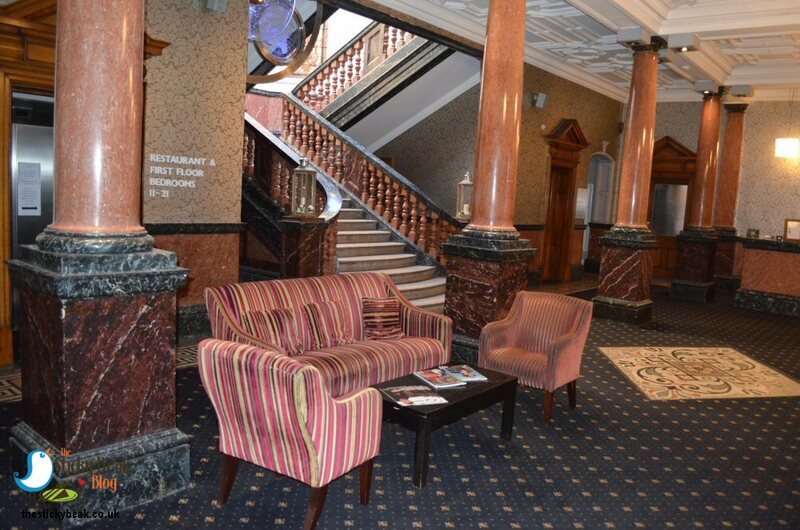 We bustled along purposefully and soon found ourselves back in the stunning reception area. I left The Man dealing with the paperwork whilst I went off to admire the painstakingly restored mosaic floor and stunning Scagliola marble pillars. 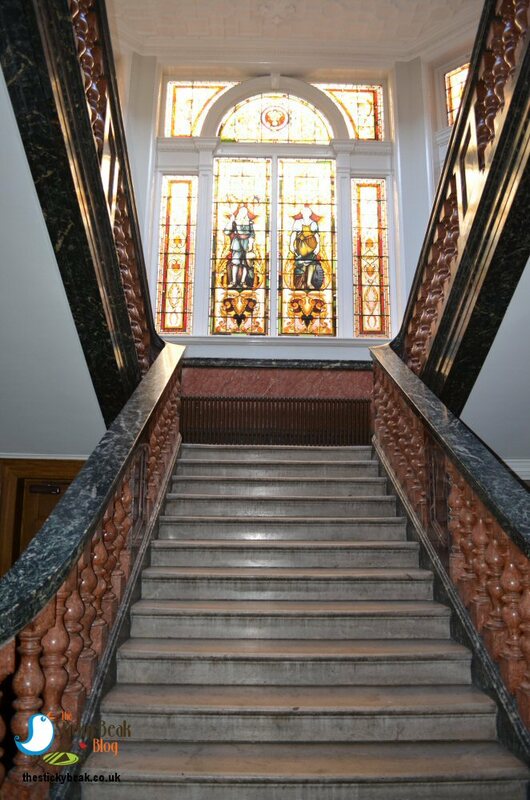 Just off reception is Bar Sixteen (the hotel address is number 16 St. Marys Gate) and a snug, tucked away lounge; what really takes your breath though is the sweeping staircase with its huge, original stained glass windows! 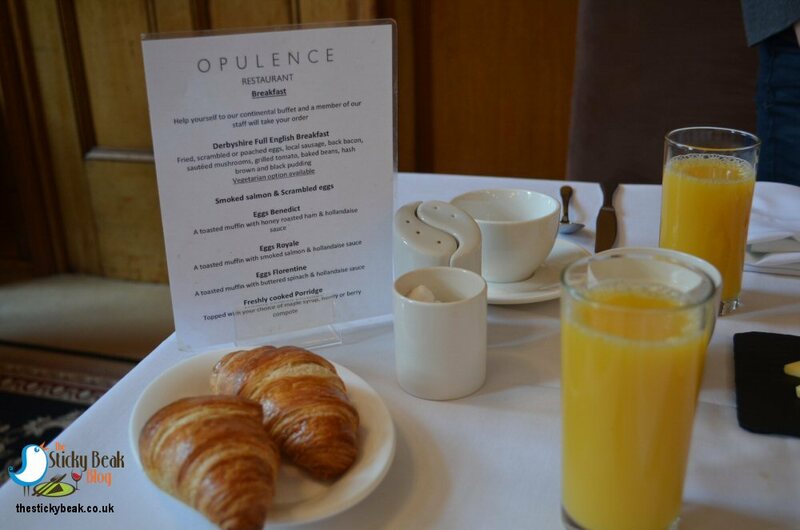 If you’re feeling peckish in the evening but don’t want to visit the Opulence restaurant upstairs, there is a lounge food menu available in the evenings, just ask the staff for a menu. Our room was on the second floor, and we were given a proper key. I’m showing my age here, but you can’t beat the feel of a key in your hand. The polished silver door handle to our room was a lovely sizeable beast that you could grab onto and it resisted nicely, to give you that authentic sensory feeling as you opened the door. 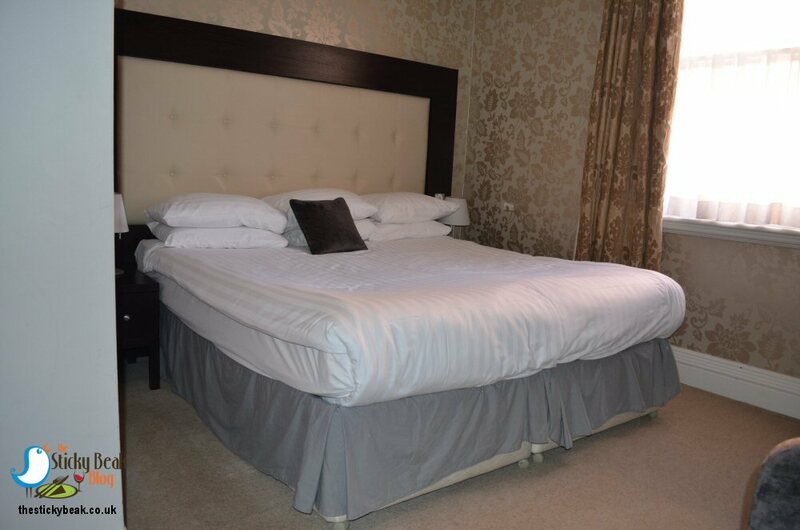 A refined, elegant palate of muted Taupe, off-grey, and cream gave our air conditioned king room a luxurious feel; a huge padded cream bed headboard stole the show from the heavy window drapes, and crisp white bed linen looked simple but stunning. The wardrobe has hangers for clothes in, and is nicely spacious; this is where the iron, hairdryer, and laptop size safe could be found too. There was a large area to place your luggage, as well as two armchairs and coffee table, desk with chair and mirror, mini fridge containing water and milk sachets, and a wall mounted flat screen TV. There were a couple of minor cosmetic things I noticed, but that’s all they were - cosmetic. 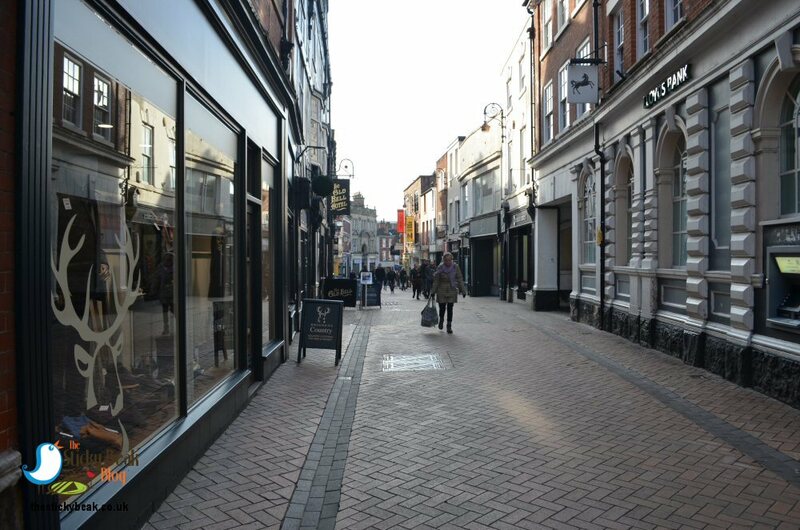 When venues are in constant use they aren’t going to remain pristine; tiles may get scuffed or cracked and hangers in wardrobes may not all match, but it doesn’t affect their use or cleanliness. Having stayed in countless hotels around the world I know when something needs mentioning to management, and these didn’t warrant it. I was pleased to see the bathroom was equally nicely appointed. On the vanity unit were Neutrogena toiletries, a mini soap tablet, and washcloths and the shower/bath combo had a rail with generously sized bath towels on it. 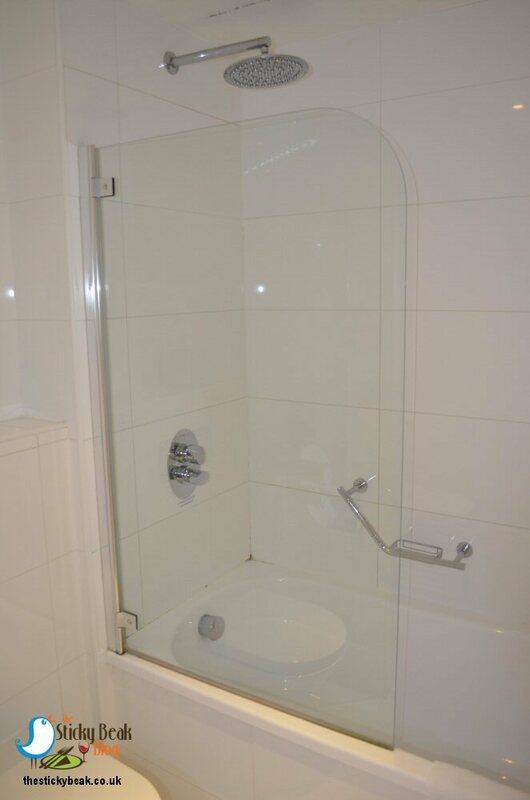 Speaking of the shower, it had one of those oversized showerheads in - perfect for those who want a feeling of pampering whilst bathing. Personally, I’m more of a bath girl, more than happy to spend hours in the bath whilst my skin slowly wrinkles like a prune! The bath in our room was lovely and deep, inviting me in to its depths; unfortunately I had to resist as the time for my massage was rapidly approaching. 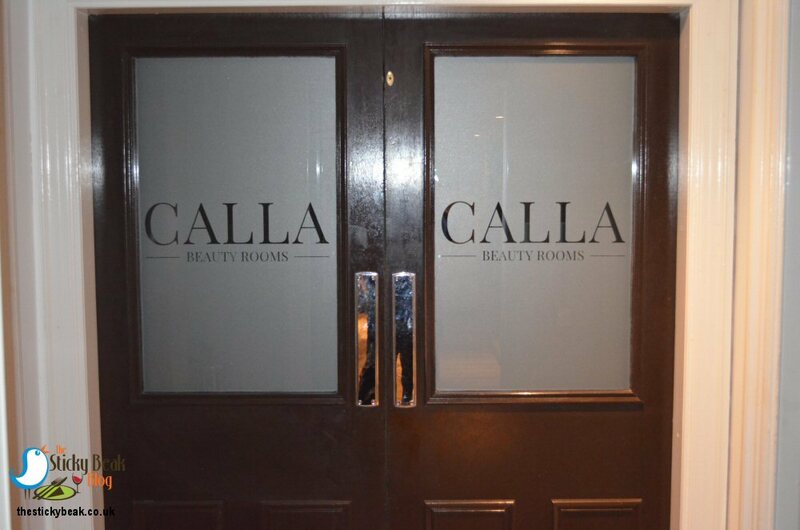 The Calla Beauty Rooms are located in the basement level of the hotel, and have gorgeous frosted glass double doors to herald your arrival. We were greeted by our lovely therapists and took a few moments to fill in our details before being ushered into our own tranquil treatment rooms. Soothing music played gently in the background and my therapist placed warm towels on me to begin the treatment. As she used a variety of massage techniques on my muscles, I could feel the knots gently easing out and tension slipping away. Time seemed suspended as I lay in a state of relaxed bliss, but all too soon my time was up and reality beckoned once again. A cool glass of water brought me gently back to earth as I made my way back through to Calla’s reception area. The Man Bird was a minute or so later to come out, and he had a calm aura about him which was lovely to see. Heeding our therapists’ advice, we headed back to our room to relax and hydrate before changing for dinner. A power nap was just the ticket to get us firing on all cylinders and we made our way to Opulence restaurant feeling on top of the world, after dinner we thanked the team before we headed back upstairs to our room for a quick change, as we’d got plans to hit Derby city’s night life! The bed really did come in to its own let me just say at this point. You may have gathered that we’d done a fair bit of drinking, dancing and general gallivanting, and it isn’t as if we’re little whipper-snappers anymore; sleep isn’t a luxury at our age, it’s a necessity! CQ hotels beds are magnificently comfortable and no sooner had our heads hit the squishy pillows and our weary bones found the deep mattress than we arrived in the land of nod. Before we knew it, it was time to get up and head down for (much needed) breakfast. I say before we knew it, but the simple truth is that we dragged ourselves back in the wee small hours so there was never going to be a generous period for sleep. Ooops! Camelia was back on duty, and plied us with tea and coffee as we desperately tried to wake up properly. The buffet style cold breakfast items and juices were beckoning and The Man Bird wandered off to get glasses of orange juice for us both and croissants for himself. I ventured up to get a vanilla crown pastry and a croissant, eagerly tucking in - despite having been fed a very generous nacho supper at Bodega the night before! 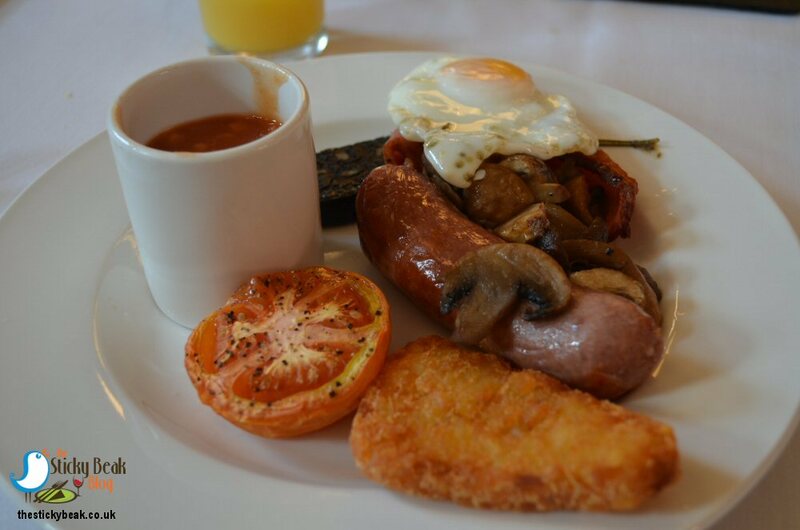 The Man had his usual Full English with fried eggs, local sausage, back bacon, mushrooms, black pudding (both of which I snaffled! ), beans, grilled tomato, and Hash Brown. He ploughed straight on in, no hesitation or decorum. 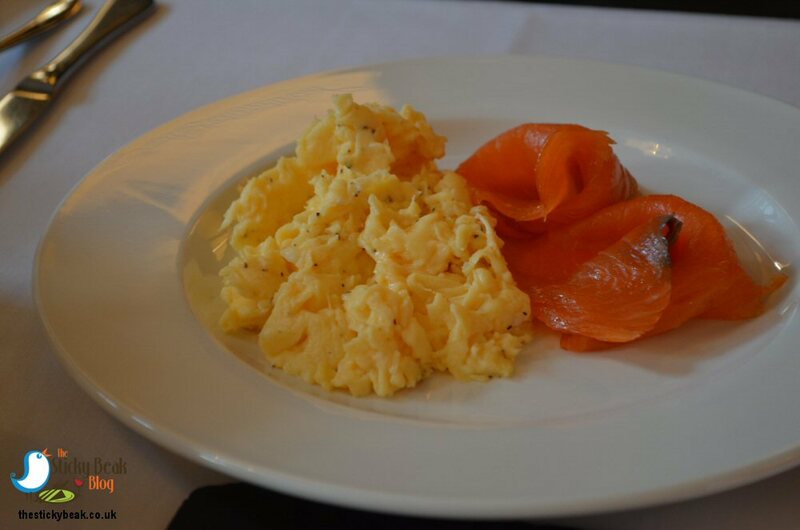 I had the Smoked Salmon and Scrambled Eggs, and the slices of salmon were lovely and thick. I love softly scrambled eggs done in a pan, and these were super - definitely worth the wait to get these done fresh. Our tummies were full again, and with our blood sugar levels rising nicely we were starting to get a bit of colour back in our gills. We finished up our drinks and went up to our room to begin packing, our stay coming to its close. 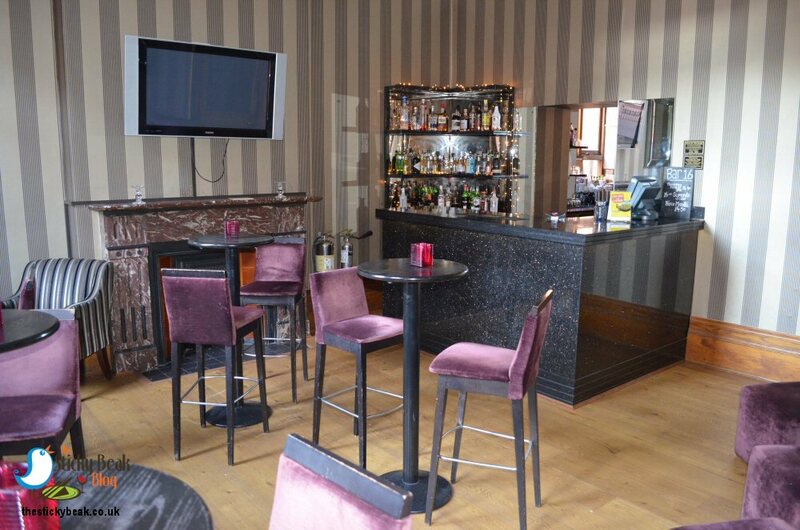 Check out was nice and smooth, and the gentleman asked if we’d enjoyed our time at the Cathedral Quarter hotel. 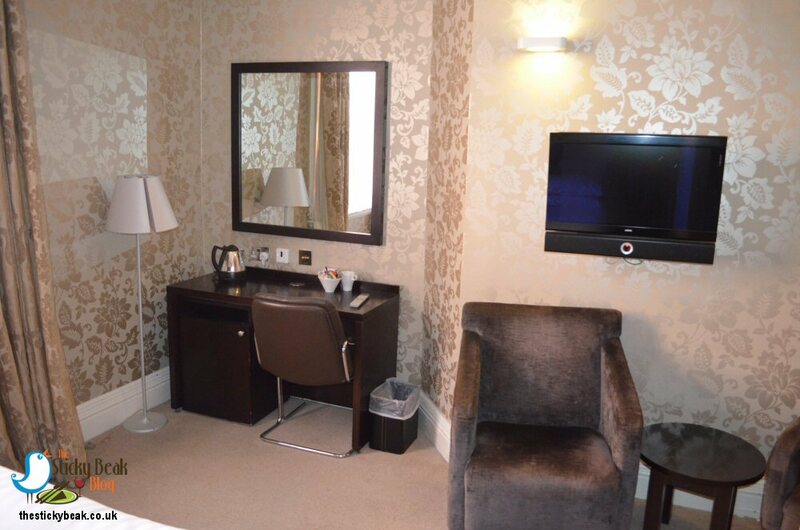 We definitely had, and would thoroughly recommend it to those wanting to stay in Derby whether for business or pleasure. Thank you for inviting us to experience your venue in more depth; it was everything we were hoping for.